The article was adopted from the original BBC material. May 18-20, 1944 the NKVD soldiers on orders from Moscow herded almost all Tatar population of Crimea to the railway wagons and sent them in the direction of Uzbekistan in 70 echelons. How did Crimean Tatars live before deportation? After the creation of the USSR, in 1922, Moscow recognized Crimean Tatars as the indigenous population of the Crimean Autonomous Soviet Socialist Republic within the framework of korenizatsiya policy (indigenization). In 1920s, the Crimean Tatars were allowed to promote their culture. In Crimea, the Crimean Tatars had their newspapers, magazines, working educational institutions, museums, libraries and theaters. Crimean Tatar language was the official language of autonomy along with Russian. In 1920-1930-ies Tatars were 25-30% of the total population of Crimea. However, in 1930s Soviet policy regarding the Crimean Tatars, as well as other nationalities of the USSR, became repressive. First it started dispossession and eviction of Tatars to the north of Russia and beyond Ural. Then came the forced collectivization, the Holodomor of 1932-33 and the Great purge in 1937-1938. When the deportation took place? The main phase of the forced relocation occurred within the incomplete three days, starting at dawn May 18, 1944 and ended by 4 p.m. of May 20. A total of 238,500 people were deported from the Crimea. That was almost all of the Crimean Tatar population. To do this, the NKVD deployed over 32,000 soldiers. What was the reason for the deportation? The official reason for forced relocation was the accusation of all Crimean Tatar people of treason, “the mass extermination of the Soviet people” and collaboration with the Nazi occupiers. However, historians suggest informal migration causes. Among them was the fact that the Crimean Tatars have historically had close ties with Turkey, which the USSR at that time regarded to be a potential adversary. In the plans of the Soviet Union, Crimea was a strategic base for a possible conflict with Turkey, and Stalin wanted to be safe from possible “saboteurs and traitors”, whom he considered Tatars to be. This theory is indirectly proved by the fact that from the areas of Caucasus bordering with Turkey other Muslim ethnic groups were relocated as well: Chechens, Ingush, Karachai and Balkars. Did Crimean Tatars support the Nazis? According to historian Jonathan Otto Paul, the anti-Soviet combat units formed by the German authorities included 9,000 to 20,000 Crimean Tatars. Some have sought to protect their villages from the Soviet partisans, who, according to the Tartars themselves, often oppressed them on a national basis. Other Tatars joined the German troops due to the fact that they were captured by the Nazis and wanted to lighten the heavy conditions in POW camps in Simferopol and Nikolayev. At the same time, 15% of the adult male population of the Crimea fought on for the Red Army. During the deportation, they were demobilized and sent to labor camps in Siberia and the Ural. How was the forced relocation conducted? The officers of the NKVD were coming to Tatar homes and told owners that because of the treason they were being eviction from Crimea. They were given 15-20 minutes to pack. Officially, each family had the right to take up to 500 kg of luggage, but in fact they were allowed to take much less, and sometimes even nothing at all. People then were taken to railway stations by trucks, from where almost 70 trains with tightly closed wagons overflowing with people were sent east. During the relocation about 8,000 people were killed. The most common cause of death was thirst and typhoid. Some people could not stand the pain and went crazy. All the assets remaining after the Tatars in Crimea were expropriated by the state. Where did Crimean Tatars were deported? Most Tatars were sent to Uzbekistan and its neighboring regions of Kazakhstan and Tajikistan. Small groups of people were settled in the Mari ASSR, in the Urals and in Kostroma region of Russia. What were the consequences of the deportation? During the first three years after the deportation about 20% to 46% of deported Tatars died of exhaustion and diseases. Almost a half of the people who died the first year were children up to 16 years. Due to the lack of clean water, poor hygiene and lack of medical care among the deportees they were subject to malaria, yellow fever, dysentery and other diseases. What was their status in Uzbekistan? The vast majority of Crimean Tatars were moved to the so-called special settlements, surrounded by armed guards, checkpoints and barbed wire fences, the areas more like labor camps than villages for innocent people. Newcomers were cheap labor, they were used to work on collective farms, state farms and industrial enterprises. One of the hardest employments was heavy work at the construction of Farkhad hydroelectric power station. In 1948, Moscow recognized the Crimean Tatars as lifelong relocated settlers. Those who without the permission of the NKVD went beyond his special settlement, for example, to visit relatives, were at risk of 20 years of imprisonment. Such cases were indeed registered. Before deportation propaganda fomented hatred among local residents to the Crimean Tatars, branding them as traitors and enemies of the people. According to some historians, Uzbeks were told that the people coming to them were “cyclops” and “cannibals” and advised to stay away from the aliens. Later, after learning that the Crimean Tatars were of one faith with them, Uzbeks were surprised. Children of migrants could get education in Russian and Uzbek languages, but not in the Crimean Tatar. By 1957, any publication in Crimean Tatar language were prohibited. The article about the Crimean Tatars was removed from the Great Soviet Encyclopedia. This nationality was removed as an option to be stated officially in a passport. What has changed in the Crimea without Tatars? After Tatars and Greeks, Bulgarians and Germans were deported from Crimea, in June 1945 the peninsula ceased to be an autonomous republic and became a region of the RSFSR. The southern regions of the Crimea, previously inhabited mostly by Crimean Tatars, were left deserted. For example, according to official data, in Alushta region only 2,600 inhabitants were left, in Balaklava the number was 2,200. Subsequently, people from Ukraine and Russia were relocated here. The Soviet authorities destroyed the Tatar monuments, burned manuscripts and books, including volumes of Lenin and Marx that were translated into Crimean Tatar language. Cinemas and shops were opened in mosques. When the Tatars were allowed to return to Crimea? Special settlement regime for the Crimean Tatars existed until the era of Khrushchev’s de-Stalinization of the second half of 1950s. Then the Soviet government extenuated for their living conditions, but did not remove the charges of high treason. In 1950-1960s Tatars fought for their right to return to their historical homeland, including by means of demonstrations in Uzbek cities. In 1968, the occasion for one of these demonstrations was Lenin’s birthday. Authorities broke up the rally. Gradually, the Crimean Tatars managed to extend their rights, yet informal, but no less strict ban on their return to Crimea was in effect until 1989. Over the next four years, half of the Crimean Tatars then living in the USSR, 250,000 people, returned to Crimea. Did the deportation have the features of genocide? Some scholars and dissidents believe that the deportation of the Crimean Tatars meets the definition of genocide adopted by the United Nations. They argue that the Soviet government intended to destroy the Crimean Tatars as an ethnic group and purposefully proceeded to this goal. 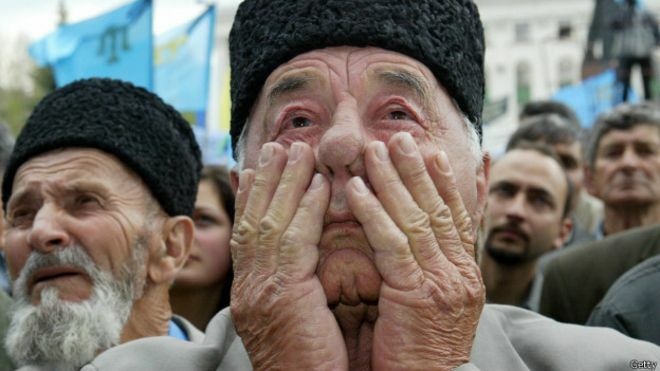 In 2006, the Kurultai of the Crimean Tatar people appealed to the Verkhovna Rada with a request to recognize the deportation as genocide. Despite this, the majority of historical works and diplomatic documents consider the forced resettlement of Crimean Tatars to be deportation rather than genocide. The term “relocation” was used in the Soviet Union to that end.